If you’re investing in new hearing aids with the help of your audiologist in Littleton, hearing aid accessories are another important consideration in developing a complete hearing loss treatment plan. While today’s technology is closer than ever to recreating natural listening, certain situations can still prove challenging for hearing aid wearers. Hearing aid accessories work in tandem with your hearing devices to amplify sound or improve ease of use whenever you need a helping hand. Depending on your listening needs, your hearing care provider will explain which accessories you may find helpful. Some examples of popular hearing aid accessories in Littleton are assistive listening devices, wireless accessories and portable microphones. Wax guards, cleaning kits and dehumidifiers are also helpful in getting the most out of your hearing aids each and every day. From nightly cleanings to clear conversations to seamless connections, hearing aid accessories promise to give your hearing a boost. 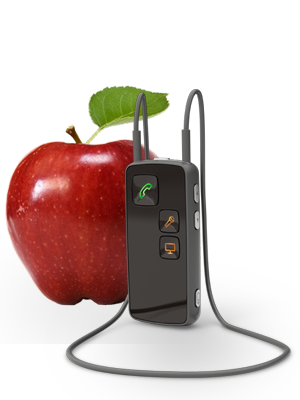 Assistive listening devices (ALDs) are helpful in situations where the speaker is far away, poor acoustics make hearing difficult or there is excessive background noise. These devices wirelessly transmit sound from the source to a receiver worn near the ear. There are three types of ALDs available: FM systems, infrared systems and audio loop systems. Wireless accessories allow users to connect to many electronic devices using Bluetooth® technology. You can use these accessories to stream sound from your TV, computer, tablet, cell phone, in-car entertainment system, MP3 player and more directly to your hearing aids for clear, convenient listening. Wireless technology also allows for remote controlling of your hearing aids using a handheld device or an app on your smartphone. Portable microphones can be attached to your companion’s clothing to aid in conversations when there is excess background noise. These tiny microphones are about the size of a pen, and they wirelessly transmit sound directly to your hearing aid to improve the clarity and quality of the speaker’s voice. Cleaning tools and kits are the best way to effectively clean your devices daily. They allow you to gently and thoroughly clean your hearing aids inside and out, preventing damage, cleaning hard-to-reach areas and keeping your instruments working great. Dehumidifiers and dryers remove built-up earwax and excess moisture from your devices overnight. Dehumidifying your hearing aids each night will help them work better, last longer, require fewer repairs and need less thorough daily cleanings. Wax filter and guards prevent your naturally occurring earwax from building up, which can break or clog the important internal components of your hearing aids. These tiny accessories will need to be replaced every so often in order to effectively stop wax from getting into the internal sections of your devices.